The District Department of Transportation (DDOT) and local law enforcement agencies would like to advise residents and travelers that there are several special events scheduled for this weekend that could impact traffic in the District. This event is scheduled from noon to 4 pm on Saturday October 2. The rally will take place at the Lincoln Memorial and numerous streets on and around the National Mall will be impacted between 6 am and 6 pm. Also, U.S. Park Police report the Memorial Bridge will be closed to vehicular traffic from approximately 10 am until 6 pm. For more information about the exact street closures and times please contact Park Police. For more information about the event, visit www.onenationworkingtogether.org. This event is scheduled from 8:15 am to 11 am on Saturday, October 2. The walk will begin and end at Freedom Plaza and Pennsylvania Avenue, NW between 13th and 14th Streets will be closed from 3 am until approximately 2 pm. There will also be rolling closures along the route (see the map below). 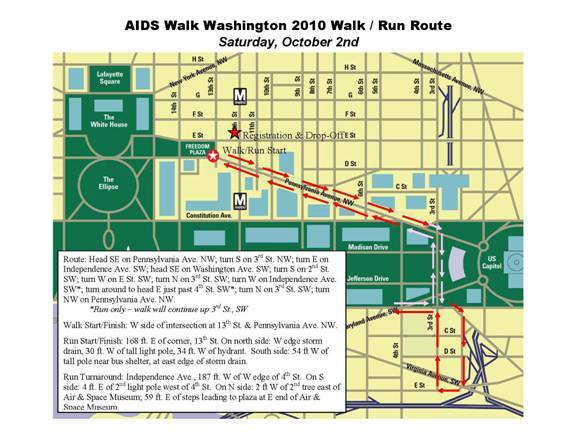 For more information visit the event website at www.aidswalkwashington.org. Continues after the jump including the Turkish Festival. This event is scheduled from 11 am to 3 pm on Saturday October 2. As a result 13th Street, NW between K and L Streets will be closed from 6 am until 6pm Saturday. This event is scheduled from 11 am until 7 pm on Sunday, October 3. Pennsylvania Avenue, NW between 13th and 14th Streets, and 13th Street, NW between Pennsylvania Avenue and E Street will be closed from 4 am until 10 pm Sunday.